This is a kit that is meant to both make your Transfercase stronger and more quiet. 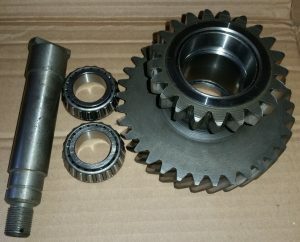 It does however require your intermediate gear to be machined, we offer this process as well. Including: Timken bearings and races, Special machined shaft, Special machined collar spacer, O-rings, Nut to secure shaft, and Washer. 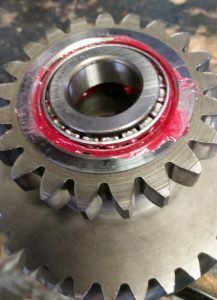 Machining should take about 1 week time to completed, and is able to be done with either new or used intermediate gear regardless of tooth count for the D-18 and D-20. This kit is made by Advance Adapters and is of very good quality, we have installed many of them and praise the functionality. We offer this upgrade option to any D-18/20 transfercase we rebuild as well, at no additional labor charge to install.